By Norman Chan on Dec. 12, 2012 at 6:30 a.m. The incredible story behind the construction of Han Solo's original blaster in Star Wars and the two-year effort by prop replicators to painstakingly recreate it down to the last detail. 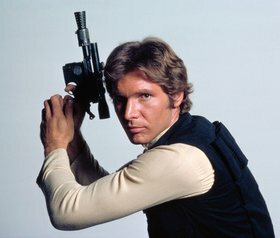 Your typical Han Solo cosplayer will spend hours tailoring the essential pieces of Harrison Ford's iconic outfit--black utility vest and boots, a swaggerific collared shirt, tight navy pants with that standout red blood stripe, and low-rise gun belt. And when it comes to Han's DL-44 blaster pistol, eBay and Etsy list an arsenal of readymade blasters aimed at the cosplay market for around $50. These blasters, custom painted with faux-metal weathering and sometimes touting sound effects or even Airsoft functionality, capture the general gestalt of the DL-44. They have the familiar muzzle, grip, scope, and shape of the blaster--good enough for the casual costumer who just needs something serviceable for Halloween or a weekend convention. But far from good enough for the more discerning eye. In fact, read the fine print on those listings and you'll see that these replicas are just $8 toys made by Halloween costume company Rubies--repainted and sold at a 600% markup. That detail would be inescapable to Carson Case and Pat Matera, who, for the past 18 months, have been unearthing and studying every detail and dimension of Han Solo's blaster from Star Wars: A New Hope. They've pored over every available photo and nugget of information pertaining to the original prop with forensic-level scrutiny. They've debated over the tiniest of details and contested long-accepted specs to a point where every new revelation is like a breakthrough in a decades-old cold case. It's kept them up at night and infiltrated their dreams. In other words, they've reached Adam Savage-levels of obsession. That's appropriate, because like Adam, both Case and Matera are replica prop builders and members of the Replica Prop Forum. It's on The RPF that Case and Matera--who go by the handles Deadbolt and KPax, respectively--indulge their obsession. Their investigation began in June 2011 over the topic of the DL-44 baster's gun barrel. 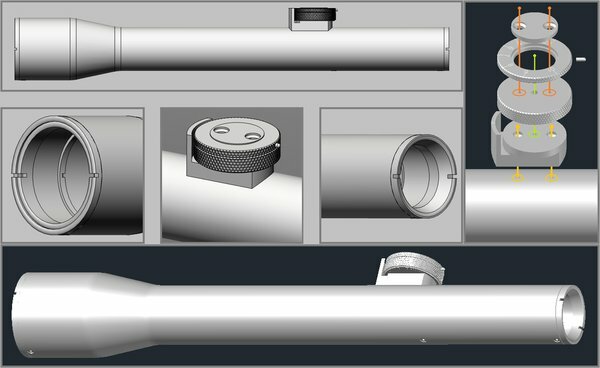 It had been a long-agreed upon fact among prop replicators that the barrel of the prop blaster--the part between the receiver and muzzle--was fully cylindrical. Case proposed that not only did the barrel have a small tapered chamfer on its underside, but that the entire bottom of the barrel was actually milled flat. Earth-shattering, right? That may seem like an inconsequential detail, but it's exactly the kind of minutia that excites replica prop makers and launches a 68-page forum thread spanning 18 months re-examining every known facet about Han Solo's blaster. Cold case reopened. For the uninitiated, the Replica Prop Forum is the epicenter of the replica prop community--a place where prop makers of all skill levels converge to share their projects, discuss prop details, and even sell limited runs of their finished replicas. Community members make props from all forms of media--movies, tv shows, videogames, and comics. There are people building their own batmobiles, pulse rifles from Aliens, and just about every iteration of Iron Man armor that has graced the silver screen (by my count, currently 10). It's a subset of the maker movement completely unabashed with their love for popular culture, and as Adam puts it, who make things they can't not make. "I think an impressionable character along with the right actor can make you love a prop all the more, and especially in this case where the prop itself was built up gorgeously to begin with. The mixing of familiar and not so familiar parts making up the prop, none of which were made to be attached to one another originally, managed to turn out one very artistic prop." Image Credit: Flickr user Vasnic64 via Creative Commons. An awfully cool hero paired with an awfully cool gun. Plus the fact that in Star Wars lore--specifically the 1979 book trilogy The Han Solo Adventures--Solo is explained to have illegally modified his blaster for a faster draw definitely speaks to the maker mentality. It's not just any BlasTech DL-44 fans are replicating--it's Han Solo's, which carries along with it a mythical weight and illustrious history. And in terms of its original construction, Han Solo's blaster from Episode IV is actually one of the more storied props of Star Wars. For Star Wars, George Lucas wanted to film sets and props that looked like they had existed for thousands of years. For the production of Star Wars: A New Hope, George Lucas charged his set designer, John Barry, and set decorator, Roger Christian, with creating a fictional universe that looked "lived in". Contrary to the slick design of science-fiction productions like Flash Gordon, Lucas wanted to portray environments that looked like they had existed for thousands of years, with all the grime and patched-togetherness that would allude to an untold history and mythology. LucasFilm's ILM model shop--staffed with veterans of 2001: A Space Odyssey's production--carried out that vision in their creation of the kitbashed vehicles and miniatures that awed viewers from the very opening shot of Star Wars. "I took George to all the fun places," Barry adds. "We went to one of the big weapon-hire companies that had endless rows of arms and armor...George and the dresser, Roger Christian, and I got together a lot on those things. Rather than have you slick streamlined ray guns, we took actual World War II machine guns and cannibalized one into another. George likes what he calls the 'visceral' quality that real weapons have, so there are really quite large chunks of real weapons with additional things fixed on to them. It's just so much nicer than anything you can make from scratch; it stops them from having that homemade look." The "fun place" Barry refers to is likely Bapty & Co., the British armorer hired to piece together the weapons in Star Wars. 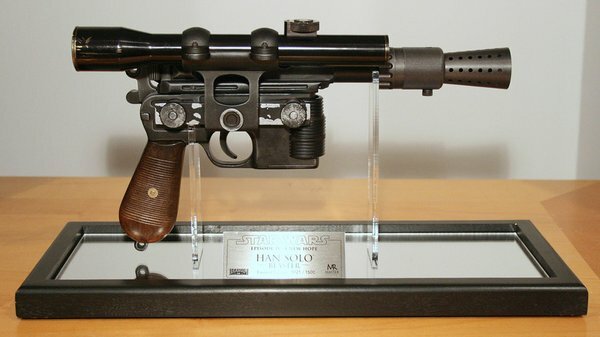 Brandon Alinger, the Chief Operations Officer of movie memorabilia company Prop Store of London (who also happens to be the founder of the Replica Prop Forum) told me that most of the handheld props built for Star Wars were a collaboration between Roger Christian and Bapty gunsmith Karl Schmidt. Unfortunately, the current staff at Bapty was unable to find anyone still working there who could speak to the props of Star Wars, due to the original team having retired or moved on to other jobs. 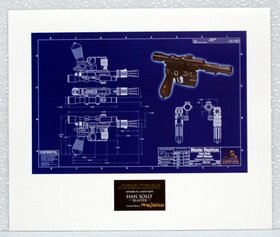 John Barry unexpected passed away from meningitis during the filming of Episode V. But even without first-hand sources from the original production team, fans like Case and Matera have been able to literally piece together the construction of Han's DL-44 blaster through careful study. The most important component in building Han Solo's blaster is the pistol used for its base, and it's well known that the body for the DL-44 was a German semi-automatic pistol, the Mauser C96. This is easily identifiable by the distinct box magazine in front of the trigger and curved grip in the shape of a household broom handle (the gun is affectionately nicknamed "Broomhandle" in the western world). The Mauser C96 was a very popular pistol in the early 20th century--Winston Churchill is reported to have favored it--and was a mainstay of serials and fantasy characters of that era like the Rocketeer. 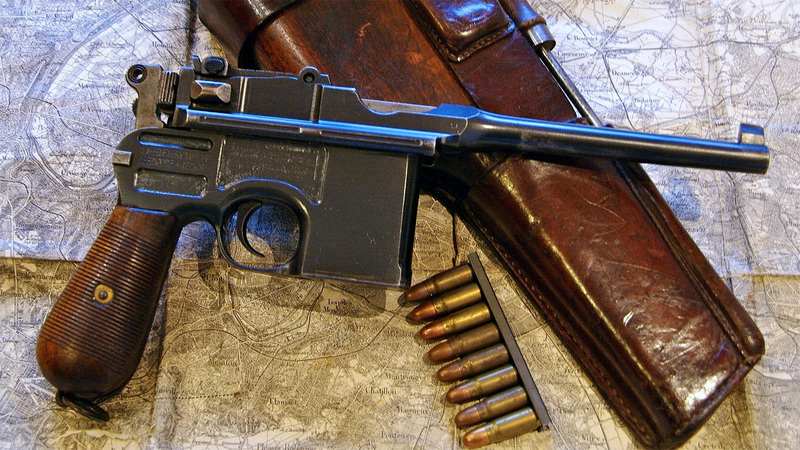 But there wasn't just one Mauser C96 pistol. 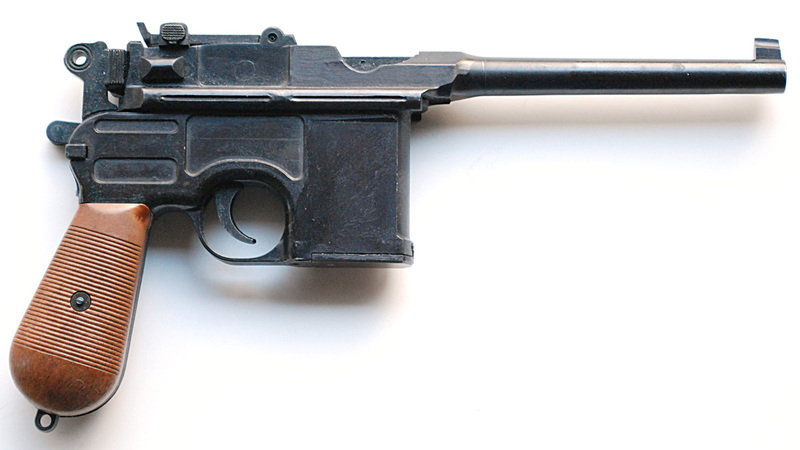 Over its 40 years of production of the C96, Mauser made many variants of pistol, each of its own unique identifiers. The "Red 9" version has the numeral 9 burned and painted in red on the grip to indicate that it utilized 9mm bullets instead of the standard 7mm. 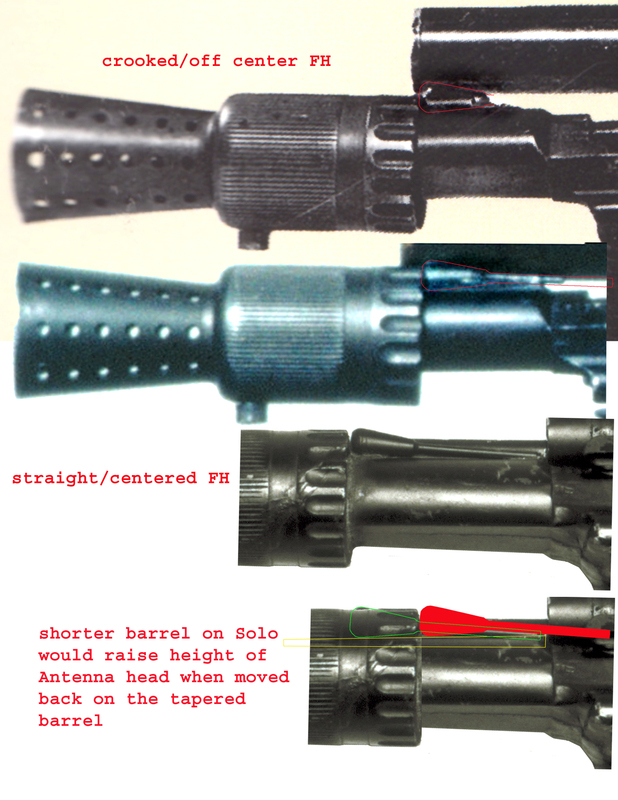 A variant nicknamed the "Bolo" made for Soviet Union had a distinctly shorter barrel and flatter curve at the base of its grip. 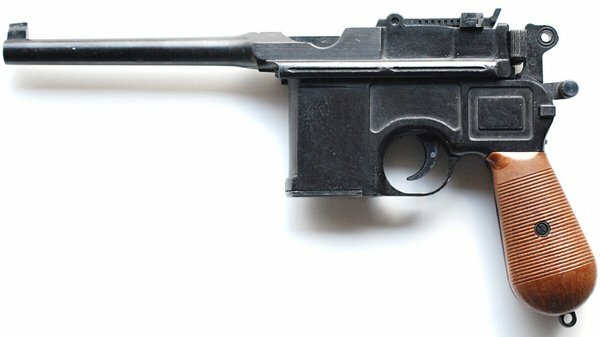 Fans have not ascertained exactly which Mauser C96 model was used for Han Solo's blaster, but settle for a standard-looking model like one of the hundreds of thousands manufactured and used in China during World War II (as there are more of those floating around the gun collectors circuit). Gun collectors aren't always happy seeing a vintage gun with real historical value milled and destroyed by geeks. 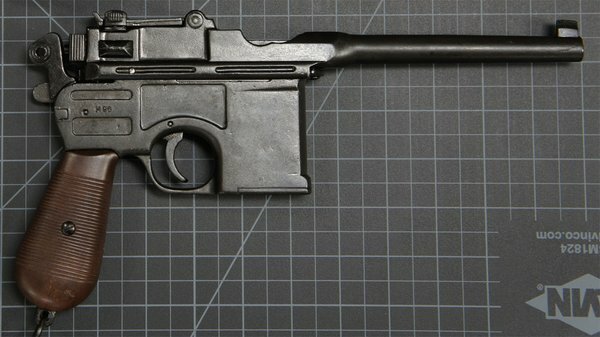 Even though there were hundreds of thousands of Mauser C96s produced in the past century, getting your hands on one to build a DL-44 replica is no easy task. For one, most Mausers that show up at gun shows are in well-worn condition, and even those start at hundreds of dollars and go into the thousands. 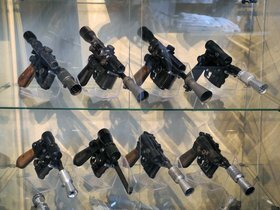 And like the vintage camera collectors who have noticed a sharply depleting supply of Graflex flash handles, gun collectors too are wise to the DL-44 prop replicator's demand for Mausers. Except they're not always happy about seeing a vintage gun with real historical value milled and in-effect destroyed to satisfy some silly film nostalgic. A selection of his blaster collection, courtesy Markus Odendall. "I strive to improve my collection and would like to have the best available representation of a prop. This includes having as many of its original components as possible, of course. But there are major limitations such as availability, and therefore, prices for some of the needed parts. For all those who are financially unable or unwilling to spend that much money on real parts, accurate reproductions are the only option." In terms of substitutes for a real Mauser, there are two go-tos for DL-44 replicas. The most accurate is a C96 reproduction made by a japanese company called MGC--Model Gun Corporation. MGC is the oldest known gun replica company, founded in 1963. 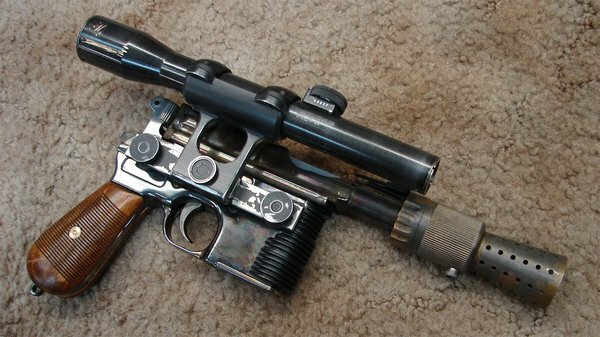 What's unique about the MGC Mausers is that they were actually used by LucasFilm production as the basis for DL-44 blasters after Episode IV, so in essence they are original prop components. These full metal replicas didn't fire real bullets, but were full-fledged plug fire cap guns and had very few identifying marks or logos that called them out as fake guns. 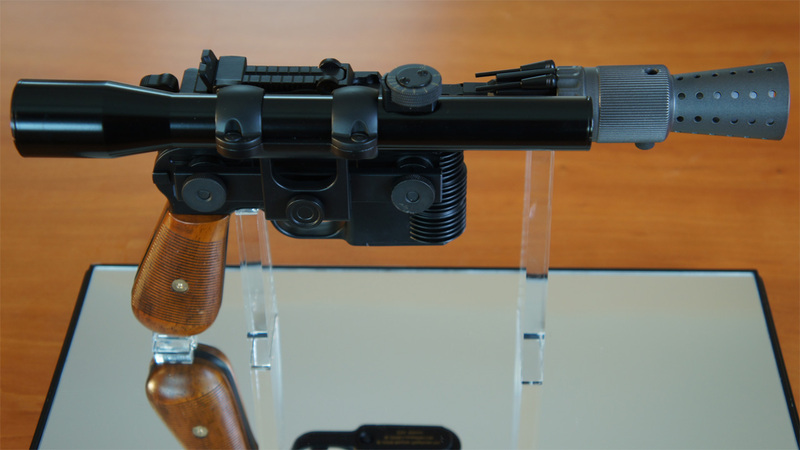 MGC Mausers were sold outside of Japan under the brand RMI--Replica Models Inc--but the company went bankrupt in 1994 and in no longer in operation. They're getting increasingly difficult to find, but pop up on eBay occasionally for around $300. An MGC Mauser replica, courtesy Chris Trevas. The most affordable Mauser replica available in production today comes from a Spanish company called Denix. Readily available on Amazon for around $60 (with Prime shipping! ), these Mauser replicas are still made of metal and have working trigger action, but are much less accurate in the minute details than the MGC build. They're also only sold with plastic grips, which hobbyists replace with wooden ones found on gun parts resellers--a pair of walnut grips cost another $60. The other issue with the Denix replica is that it's actually slightly larger than a real Mauser or even MGC part. That means builders have to shave metal off the gun frame and sand the replacement grips in order to refit them. An affordable Denix Mauser replica. All this work and that's just for the base pistol. The rest of the DL-44's components each have similar histories, and some are even more obscure. There's the "flash hider" muzzle which comes from an MG81 aircraft-mounted machine gun, of which--according to Odendall--only one or two have ever come into the hands of Star Wars collectors. There's the scope, which was deduced to be a Hensoldt & Wetzlar Ziel Dialyth 3x scope from World War II. This part is a little easier to find, going for 30 Euro in Europe and up to $1500 in the US. There's the scope mount, which was custom made for this gun by Bapty. Then there are details like the "heat sinks" along the edge of the box magazine, antenna sights on top of the barrel, and silver circular "mystery disk" on one side of magazine. Analyzing and studying each of these details entails pages upon pages of forum posts, often with no clear consensus to show for it. On page 38 of Case and Matera's investigation, the word of the day is "greeblies". According to ILM founding member Lorne Peterson's book on the Star Wars model shop, Sculpting a Galaxy, a greeblie is defined as "Miscellaneous mechanical details that add realism to a prop, model, or set." It's what model makers call the little widgets harvested from model kits to build their own original props--a practice known as kitbashing. With the DL-44 blaster, there is one particular greeblie that has vexed replica prop builders for years. 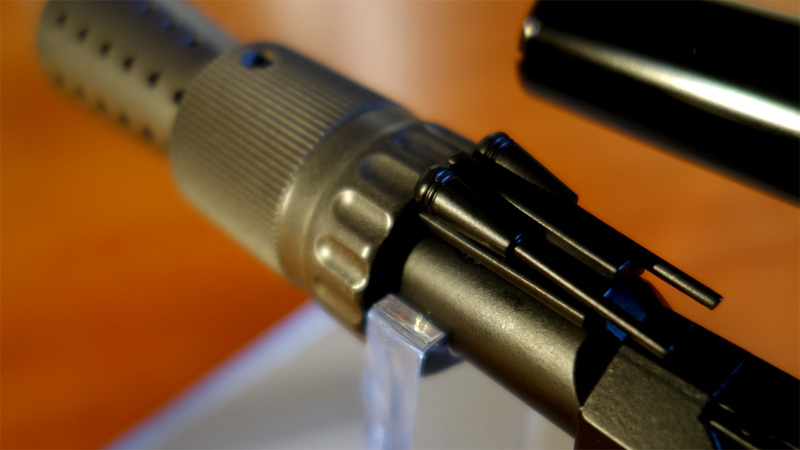 Dubbed the "antennas", these are two thin rods with a conical tip that sit at the tip of the blaster on either side of a t-track. They look like the tips of radio antennas, but could also be old toggle switches or RC remote joysticks. Fans have contested not only the size and shape of these antennas, but also their placement. Matera is confident that from his research, the two antenna pieces actually sit to the left and right of the t-track (the same rubber t-track used in the Graflex lightsaber), and not on top of it. He's posted Photoshopped overlays and scaled measurements to prove his case. This includes adjusting brightness levels on scanned photos from old Star Wars magazines, using computer models to match photos, and even mocking up makeshift clay and cardboard antennas to position on his work-in-progress blaster. This is some CSI stuff. A stunt DL-44 blaster for Empire Strikes Back, courtesy Brandon Alinger. The debate may be moot, because there is no community consensus that the antennas are even supposed to be on the DL-44. 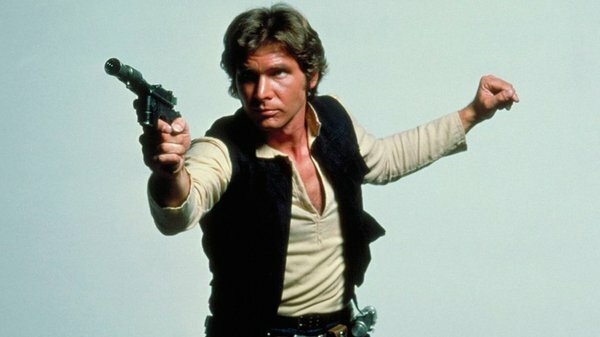 Case and Matera are basing their analysis on publicity photos of Harrison Ford posing with his blaster--the ones you've likely seen in Star Wars calendars and cardboard standees. The problem is that most of these publicity photos were taken before filming began, and subsequent behind-the-scenes photos of Harrison Ford on set in Episode IV actually don't show the antennas at all. Some time during filming, they may have been removed or just fallen off. That brings up an important question when it comes to prop replicas--what's considered canon? Is it a publicity photo? How the prop was seen on screen? What the original prop makers intended and turned in to production? Brace yourself, because it gets even more complicated. Case and Matera's project specifically concerns Han Solo's hero blaster from Star Wars: A New Hope. That distinction has to be specified because, like all big-budget productions, there was never just one version of the prop made for filming. The piece Bapty had constructed was the "hero" prop, a heavy piece to be used in close-ups and promotion shots. The production then made a casting of that model to create resin "stunt" props--lightweight and more disposable pieces that could be tossed around in action scenes. These castings would be used in creating variant resin props known as the Merr-Sonn Model 44 blasters, carried by Imperial officers in Death Star scenes. Photos of these Merr-Sonn blasters--which still had the greeblie antennas attached--are how Matera made many of his deductions when it came to the antenna placement. 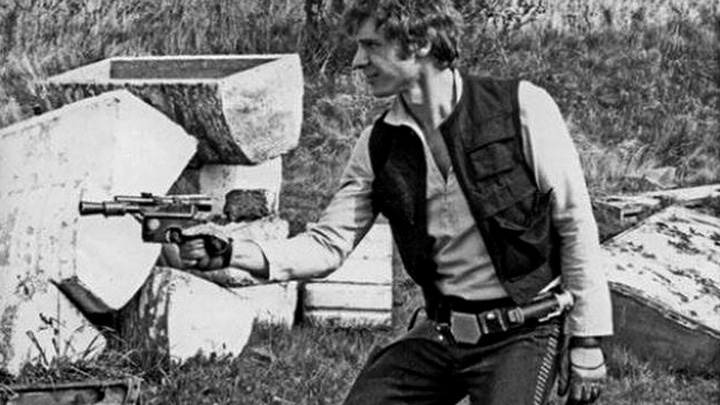 For scenes that had to be shot in the United States, like Han's showdown with Greedo, the US production team had to scrap together its own version of the DL-44. In the interest of cost, much of Star Wars was shot at Elstree Studio sound stages near London. When production moved to the United States, LucasFilm was unable to bring back some of the props created by Bapty because they working pieces that fired blanks. So for scenes that had to be shot in the US, like Han's showdown with Greedo, the production team had to scrap together its own version of the DL-44. That variant, made with an MGC replica as a base and sporting a M3 grease gun flash hider, is affectionately known as the "Greedo Killer", or GK. "For ESB, stunt DL-44 blasters were made from casting the hero prop from ANH. These resin stunt blasters have the same serial number as the hero prop as part of the casting. 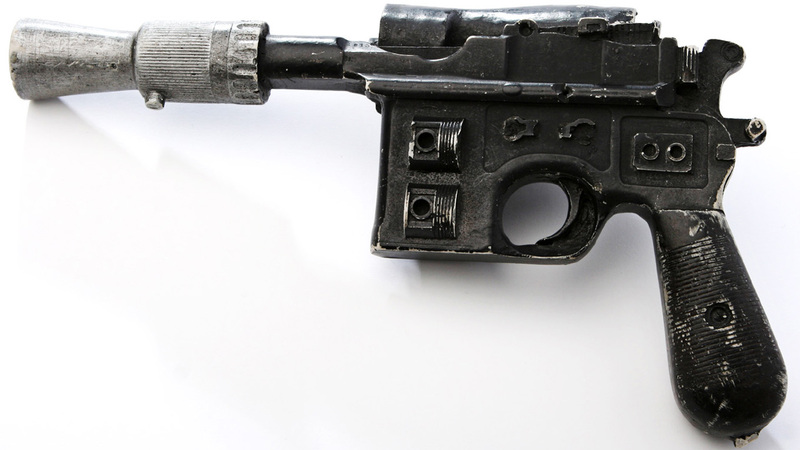 Resin stunt DL-44 style blasters were also made for the first film, and used by extras. It's possible that the ESB stunts are these same props, re-worked, or cast from the same molds." The ESB and ROTJ blaster is a distinct piece all by itself, both in design and construction, but offers little information for A New Hope blaster replica builders. So aside from publicity and behind-the-scenes photos, where do the reference materials lie for the original DL-44 blaster? 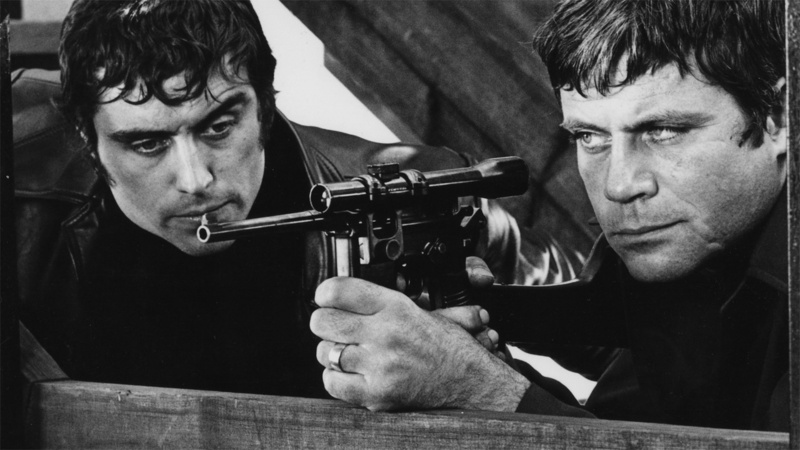 Still from The Sitting Target featuring the famous mauser, courtesy Chris Trevas. Surprisingly, answers were found in places completely unrelated to Star Wars. Bapty, the armorer for A New Hope, was also the weapons supplier for a 1967 Frank Sinatra movie titled The Naked Runner. A Mauser C96 is prominently featured in the movie, and from studying VHS screengrabs, fans have been able to confirm that this is actually the same prop that was later turned into Han Solo's blaster. In the film, Sinatra plays a former World War II sharpshooter and wields a sniper rifle that breaks down to fit inside a padded suitcase. In scenes where Sinatra is examining this rifle and assembling it, it's clear that the rifle is a Mauser C96 with a modified "bull barrel" that's larger than the standard barrel on a Mauser. The gun seen in The Naked Runner also has the custom scope mount, though it's mounted on the left side of the gun instead of the right side, as it is on Han's blaster. Bapty also supplied arms for the 1972 Oliver Reed movie Sitting Target, from which a production photograph shows a matching scope and mount, based on similar scratches, scuffs, and a matching notch on the lens ring. These two films, along with the rare production photo, are all fans have to work off of when analyzing the ANH blaster. Even the Star Wars Blu-ray release in late 2011 didn't provide additional help--1080p stills weren't clear enough to call out details like the antenna greeblies or "mystery disk". "BAPTY frequently used to sell guns that it no longer used to the government during government buybacks. They frequently disposed of modified weapons this way, since they were damaged in their eyes, and no longer suitable for work as a standard film weapon. It is very likely that this is what became of the original ANH Mauser prop." The bizzaro DL-44 with the reversed scope. 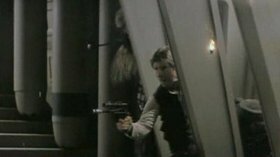 Interestingly enough, the ANH blaster--or at least its base Mauser, was seen one last time in a deleted scene from Return of the Jedi. Dubbed the "bizarro blaster", it appeared in Han's hands during an attack on the Imperial bunker on Endor. It's bizarre because in these scenes, the scope on the blaster is clearly reversed, with the objective lens at the front of the gun instead of the rear. It's also attached with a different mount that places the scope on top of the pistol body instead of to its side. "Sometimes, an original prop just turns up in unexpected places. For example, what is believed to be the original "hero" Darth Vader lightsaber was actually on display in a casino in Pennsylvania. There was only 1 "hero" Vader lightsaber made for Ep IV, V & VI." With Star Wars, there's always hope. In the 35-year history of Star Wars, it's difficult to believe that no one else has done enough research to answer all the questions about the DL-44 blaster. And to be fair, much formal research has been done, by both fans and official LucasFilm associates alike. Most of that scrutiny occurred under the purview of officially licensed collectibles. Fans of Star Wars may have heard names like Icons and Master Replicas. These were companies that made selling prop replicas their business, run by hobbyists who wanted to commercialize their skills and bring fans high-end products they couldn't find in toy stores. 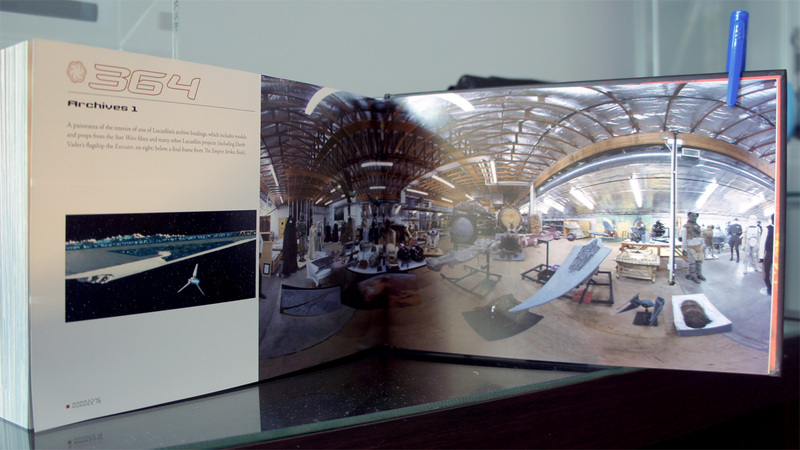 A rare look inside the Lucasfilm Archives from John Knoll's Star Wars 365 book. "After Icons had lost the license, Lucasfilm was very wary about filling the prop replicas category again. Many companies were submitting proposals, and I had to call them every 4 to 6 weeks, over about four years to see if they were setting up interviews. On one particular call, they finally said that they were reviewing formal proposals and would be arranging interviews. ...I had prepared quite a few prototypes in display cases and they later said that was one of the things that convinced them to go with us. They actually played with the replicas during the entire meeting! Ultimately, they said that we were awarded the license, because they were impressed with our combined business experience and background, my knowledge of the subject, our ability to pony up lots of money for the licensing advance, and of course, the prototype replicas [I brought to the meeting]." With a replica prop license, Dymszo and Master Replicas negotiated unprecedented access to the LucasFilm archives in 2001. "We also stipulated as part of the license contract, that we needed unrestricted access to the archive so that every replica could be as accurate as possible. This was a sticking point, as they almost-never let licensees into the archive. 99% of the time, they would get the reference and e-mail it. Most of the Lucasfilm staff had never even been to the archive themselves; entry was very restricted. But they finally agreed, and I (and other MR reps) ultimately went to the archive about 30 to 40 times and spent hundreds of hours there obtaining reference, measuring, photographing, or digitally scanning the original filming props, costumes, and miniatures." Master Replicas' first Limited Edition DL-44 replica. In 2002, Master Replicas issued the first Han Solo A New Hope blaster replica, which according to high-end collectibles site ToyTracker, was a limited edition of 1500 and had a retail price of $450. The blaster sold out quickly and Master Replicas was so proud of their product at the time that they also released a lithograph blueprint of their blaster design, framed and matted for collectors to display along with their replica. Master Replicas' second Elite Edition DL-44 replica. Unfortunately, it became clear that this blaster was not as accurate as fans had hoped. For example, its dimensions were actually scaled to that of a Denix Mauser replica, not an original or even MGC replica. 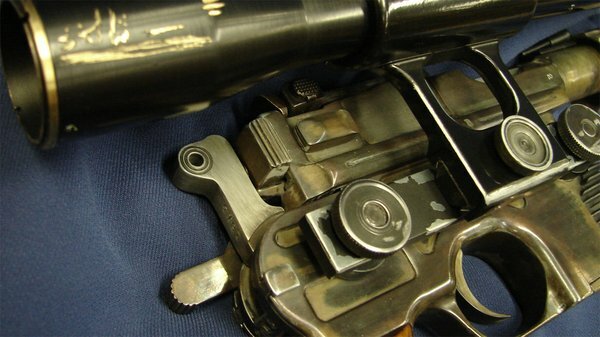 The Denix base was pretty obvious in that Master Replicas retained the stamped diamond Denix logo above the trigger on left side of the magazine. 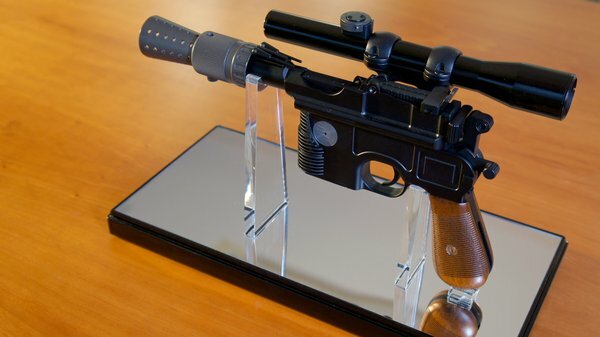 Says Dymszo of the effort: "Our first ANH replica released in 2002 was not nearly as accurate as I would have liked it to have been, but we were constrained by time/staff/budget and were forced to use the Denix mauser replicas at that time." Master Replicas would get a chance to redeem itself in 2006, when it released a second ANH DL-44 blaster replica, the "Elite Edition". This version had a much more accurately milled body and working hammer and trigger action, along with wooden grips and a see-through scope. New details discovered by other fans were incorporated, such as the three-section "heat sink" fins on the gun magazine. Acknowledging uncertain details like the presence and location of the antenna greeblies, the Elite Edition actually offered a detachable set of t-tracks so collectors could configure it as they saw fit. The China-made prop was also unweathered (ie. had no painted damage or wear) because Master Replicas felt that convincing weathering could not be done in mass production, so it was sold "as issued" by the fictional company BlasTech. There were only so many fans willing to shell out hundreds of dollars for multiple lightsaber and blaster replicas. Setting the production run of the Elite Edition to 1250 pieces and pricing it at $650, Master Replicas was surprised to find that their new prop didn't sell out nearly as quickly as the original. 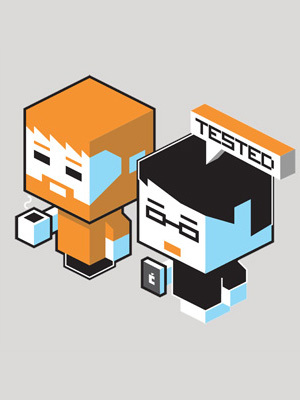 In fact, retailers held on to products and had to lower the price to as low as $400 before the final units were sold. Today, an Elite Edition Master Replicas ANH blaster fetches well above retail on eBay (I own number 113 out of 1250). But that wasn't enough to save Master Replicas, who saw the high-end collectibles market growth slow down after it was acquired by toy company Corgi in late 2006. There were only so many fans willing to shell out hundreds of dollars for multiple lightsaber and blaster replicas. The current crop of prop replica companies, like eFX and Quantum Mechanix, don't offer their own versions of the DL-44 blaster, but it's unlikely that any prop replica made in large quantities and commercially sold would satisfy the likes of Carson Case and Pat Matera. As nice as Master Replica's Elite Edition looks, it's a better prop to look at than to hold. In hand, it feels overtly like a singular object, not something that was pieced together from multiple parts. The fact that it's a mass-produced fabrication is apparent; you never get the sense that it is a pistol--real or replica--with pieces attached to it. And here's the rub: the Elite Edition is already considered inaccurate by today's prop replica standards. Replica Prop Forum members have scoured old model airplane and plumbing parts catalogues to see if they can find matching grill piece. "If Pat hadn't pointed out that the lower two pieces on the DL-44's Grill were slight tapered, which hadn't occurred to any of us, it would have been very difficult for anyone to realize that the very top piece is the same part as the lower two, but flipped, tipped and offset. Then the whole grill came together and made perfect sense, but it could have been easily left unnoticed without realizing that very slight taper first." From all the prop makers and collectors I spoke to and corresponded with, one name kept coming up as an authority on the DL-44. Chris Trevas, who goes by the name Lonepigeon on TheRPF, is an artist and longtime contributor to the Star Wars Insider fan magazine. In addition to creating Star Wars art for collectible card games, magazines, and books, Trevas also runs The Parts of Star Wars, a website that catalogs the props that have appeared in the films and their original construction. Along with fellow artist Chris Reiff, Trevas drafted the art for the official Star Wars Blueprints book released in 2008. The poster book featured 1:1 diagrams and schematics of various weapons of Star Wars, including, yes, the DL-44 blaster. For their research, Trevas and Reiff were granted access to the same reference materials from the LucasFilm image archives that was given to licensed prop companies--high-resolution photographs that hobbyists could never find with a Google search. 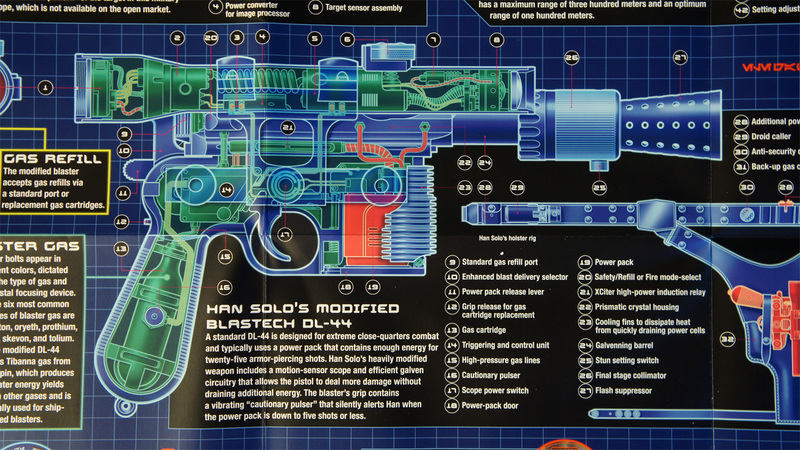 A DL-44 schematic from the Star Wars Blueprints book. As Case and Matera's epic forum thread expanded, Trevas acted as sort of a godfather to the research project, jumping in from time to time to post clarifications from his own research. Because he can't share the assets he's had access to from the LucasFilm archives, the forum researchers have to take him for his word, which has in more than one occasion lead to drawn-out disagreements over certain parts. "Most of the replica prop part businesses like Blast-Tech or Parks are not concerned with great accuracy. They supply the casual hobbyist with in-stock, good enough, parts...Really good Han ANH replica parts are rare. It's been a long time since there was a run like this. Complex pieces like the scope cradle haven't been made in metal in many, many years. There's never been a machined replica scope run. The Master Replicas Elite Edition topped all fan made pieces when it came out in 2006. Since then, most people have been buying the Elites and modifying them--adding real scopes etc. It was cheaper to buy the Elite than to machine parts that good." 3D render of the DL-44 scope, courtesy Carson Case. Case, whose day job is repairing PCs and laptops, spends his nights tweaking 3D CAD models of DL-44 blaster parts based on the new information and feedback from the forum thread. Matera, who is a sculptor and prototype developer by trade, help refine those models with insight on how those parts could be machined with steel and aluminum. 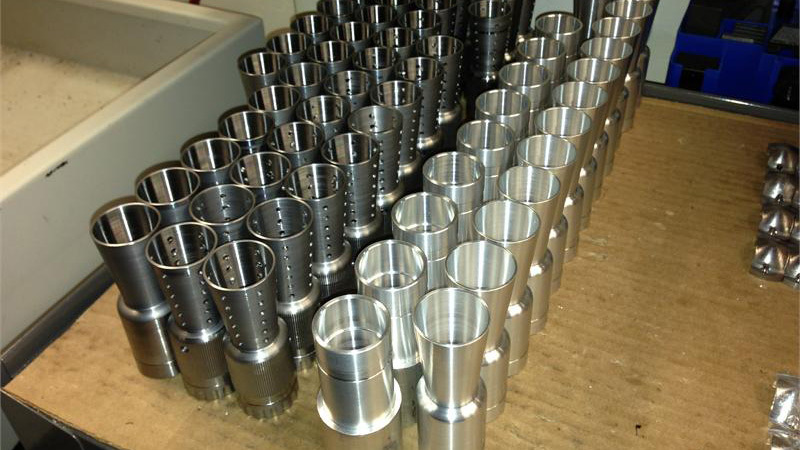 Night by night, they work out details to pass along to a New York-based machinist they've contracted to produce the run. The smallest details, like the knurling pattern on the scope mount screw, are vetted and brought back to the community for consensus. Only two dozen or so sets of these parts will eventually be made, but they're going into the eager hands of the fans who can truly appreciate them. Flash Hiders for the current replica run, courtesy DarkEnergy Creations. "There is no such thing as real '100% authenticity'. The reality of this varies with each person; their personality, experience, perception of reality, and visual acuity. I have always felt it was a little silly how some folks swear that they have the 'perfect' replica, but have never actually seen or held the original item. Photographs lie--shadows, fore-shortening, lens settings, etc, can dramatically change details and coloring on objects as we perceive them. As for colors, they change depending on the light in which they are viewed. Many gray colors for example, will absorb the color next to them and take on that shade as your eye sees it." If you saw the props as they appeared on screen, you would think they were crap. Props in movies and TV were not built to do anything but satisfy the camera. "Anybody in this business will tell you: if you saw the props as they appeared on screen, you would think they were crap. Props in movies and TV were not built to do anything but satisfy the camera. In person, a stunt weapon will really look terrible since the prop master had two weeks to create 200 guns. So "screen accurate" isn't about being a duplicate of the prop you saw on screen. We want to make what you saw in your head, and that's a much higher standard." The importance of weathering a replica--painting it so it looks old and used--can't be ignored, as it's also a heavily personal preference. Trevas likes his prop replicas weathered as he thinks the original prop maker intended, but stops short of making pieces crooked on purpose or including glue drips or other unintentional defects that occurred during film production. Case says personal preference has a mysterious effect on how a replica turns out: "The more interested you are in that particular prop and the more that's figured out about it, the more your taste will change and evolve for that prop over time. I know mine certainly has." Weathering on a modified Master Replicas Elite Edition, courtesy Steve Dymszo. "I stripped it completely down to the bare metal. This involved soaking in acetone, motorized wire brushes, sandpaper, X-acto blades, files, wounds, crying, and lots of suffering. I then machine-scotchbrited and machine-polished each part to a mirror finish and blued all of the parts to give them the proper patina. The bluing knocks some of the gloss down, so the parts dulled down to the proper level when I was done. I added several real Mauser parts and used a number stamp system to add the missing serial numbers and lettering. Lucasfilm stipulated that we couldn't make any replicas with "real world" letters, numbers, or markings on it, so those details had to be removed from all replicas. I replaced the plastic lenses in the scope with real glass, spun the scope on a lathe to thin/smooth out the paint and make it look like the original scopes, and added the Hensoldt lettering on the side. Finally, I sketched out all of the weathering on the gun and carefully added it. Including the marks in the wood grip. I used micro-mask on the scope frame, because nothing looks more like chipped paint than actually chipping the paint!" A modified Master Replicas Elite Edition DL-44, courtesy Steve Dymszo. All in all, Dymszo estimated the refurbishment took over 40 hours of work. Then he did it again to a second Elite Edition blaster. In the prop replica world, there are always details that will be left unresolved or could be improved on when new reference resources surface. Carson Case and Pat Matera were not the first to be obsessed with Han Solo's A New Hope blaster, nor are they likely to be the last. They follow a long line of collectors and prop makers whose love for digging through details, collaborating on problem solving, and building something by hand outweighs the eventual ownership of a replica prop. But at least in this project, one more detail will be resolved, and that takes us back to the original question of the cylindrical bull barrel of the DL-44, posited all those months ago. The answer to this particular investigation was found on, of all places, a grassy knoll. 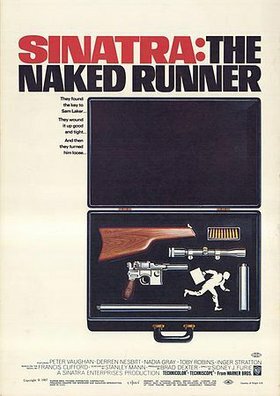 Matera was able to obtain a rare DVD copy of The Naked Runner for reference. And in a scene where Frank Sinatra lays down his modified Mauser C96 on the grass, there it was, clear as 480p could ever be: a flat-bottom bull barrel. Cue the Ewok Celebration chant. And just this week, Case emails me about exciting new findings that he and Matera may soon reveal to the community. Replica prop building is truly a never-ending saga, and that's part of its addiction. Obsessions over long-lost movie weapons; debates with zealous resolve; cathartic moments of clarity. Sounds an awful lot like a hokey religion to me, which in this case, is well matched for the beloved blaster at Han Solo's side.